It's been a while since I delved into something new to eat. My usual breakfast choices swing back and forth between porridge, toast or maybe at the weekend some kind of full English or bacon sarnie. When I was asked if I'd like to try some granola I wracked my brain in attempt to recall if I'd ever eaten any before but if memory serves me right I haven't. Lizi's Granola looks really interesting with plenty of varieties in the range; I've been trying out both the low sugar and high protein products which are suitable for vegetarians, vegans and are GL tested. The thing I've realised about trying to achieve a healthy lifestyle is that you need to include a good variety of food in your diet. It is pointless eating the same things day in day out. 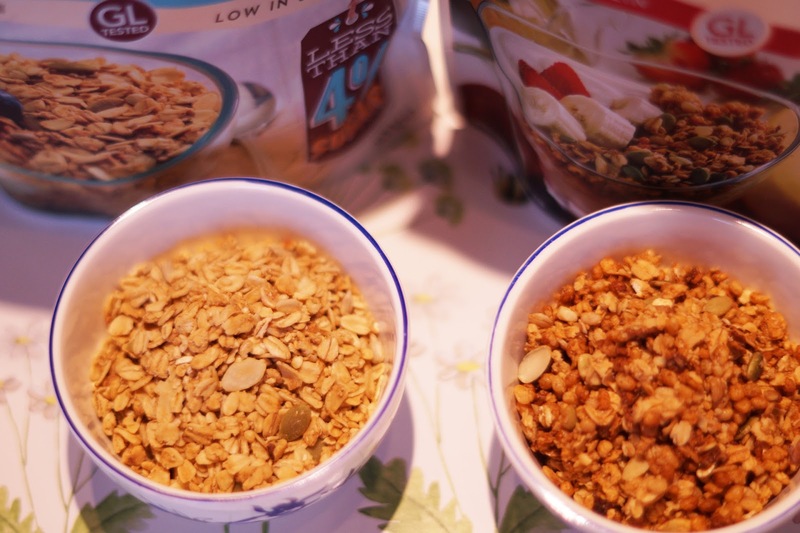 As a first look, I thought I'd compare the two granola mixes side by side. 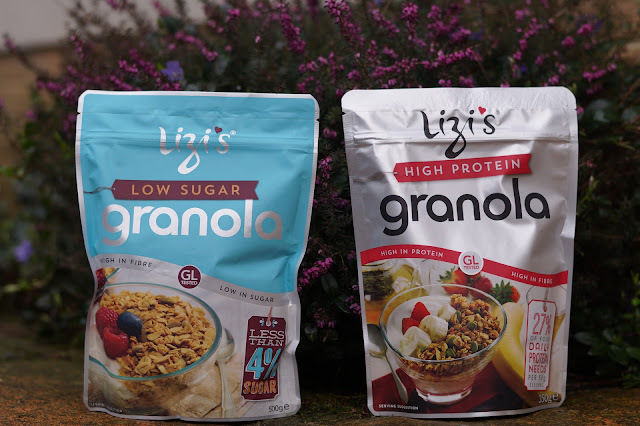 The low sugar is much paler, looks very 'healthy' full of oats and seeds. 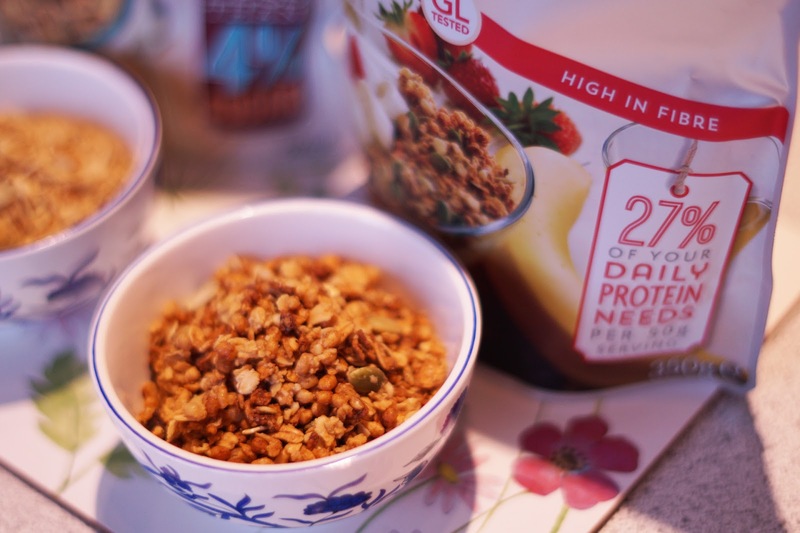 The high protein mix looks temptingly crisp and crunchy with a lovely glazed appearance. 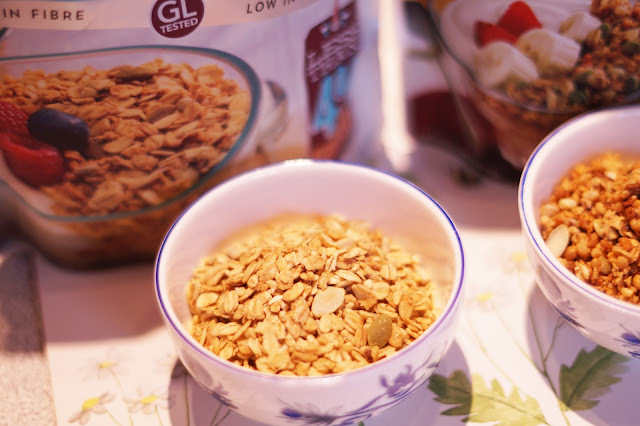 Both granola mixes are free flowing and ready to eat - straight from the packet if you fancy it (and thankfully neither of them resemble those rocky clusters which resemble something which could require your dentist on speed dial). They smell good. Appetising. 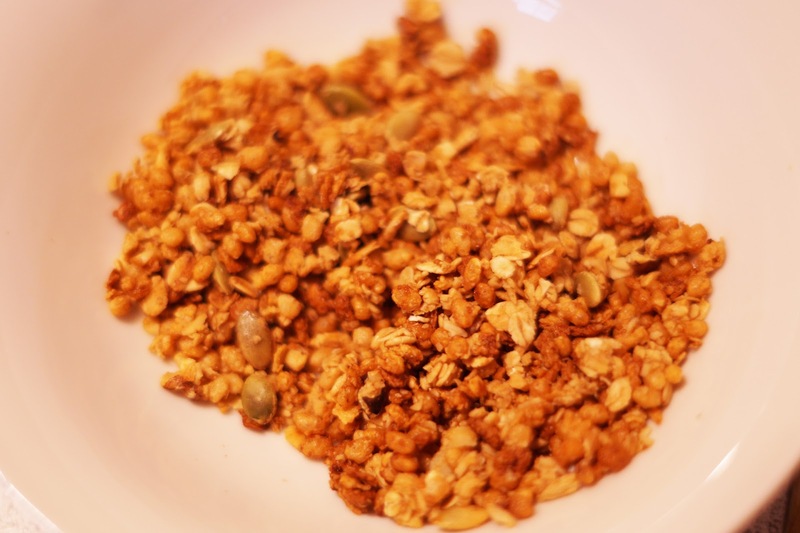 I like the idea of being able to use granola is a multitude of ways. 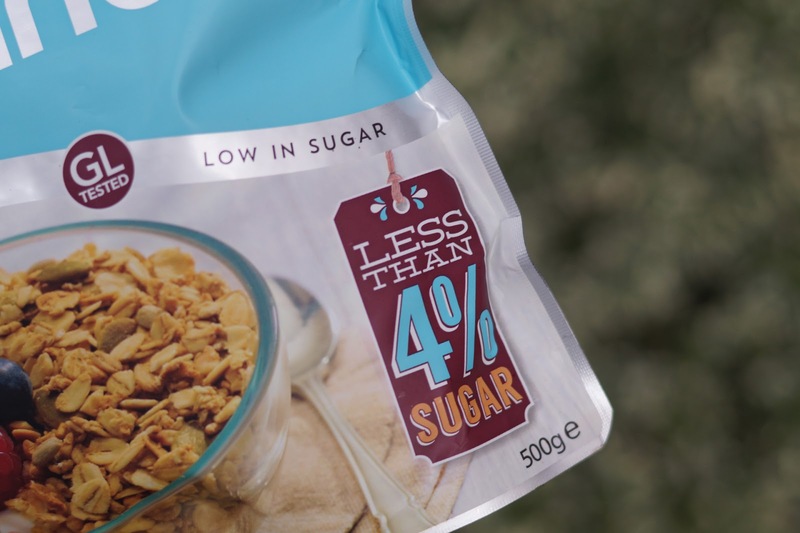 The low sugar mix is ideal for anyone who shies away from sweet breakfast cereals (RRP £3.89 for 500g). The sugar content is less than 4% and I agree, it doesn't taste particularly sweet. As a relatively health conscious individual I know that I shouldn't be eating as much sugar as I currently do and the best types of sweetness to include are fruits and honey instead of naughty spoonfuls of granuals heaped on food. 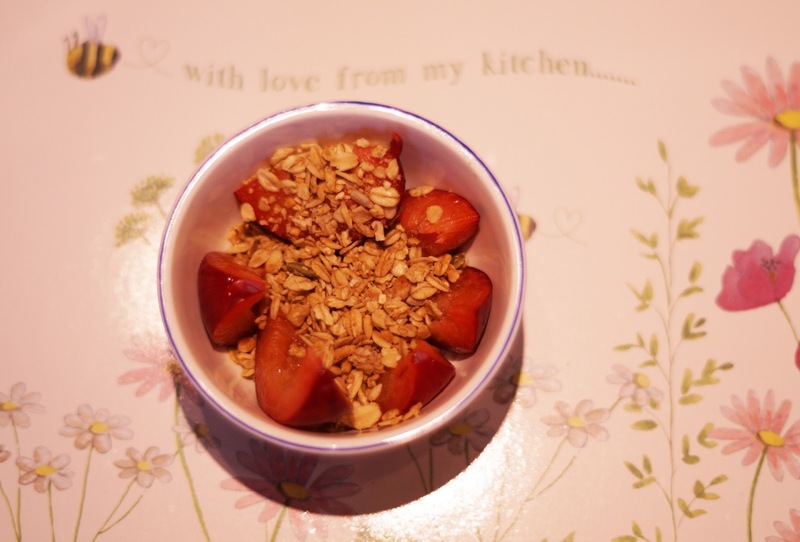 My suggestion was to eat the low sugar granola with fruit. With plums worked a treat! The low sugar mix is dairy free but contains nuts. The high protein granola looks like a real gem. 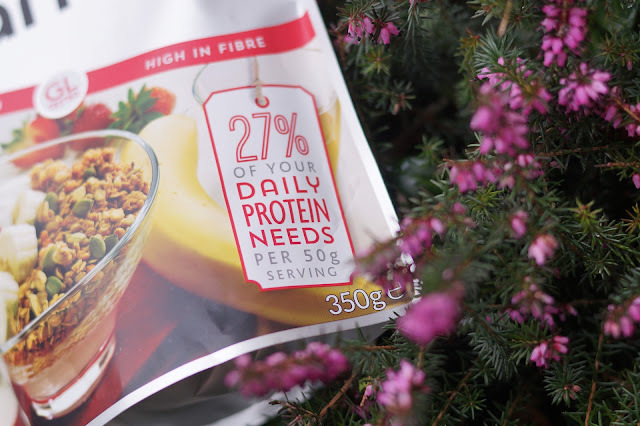 Not only is it a joy to eat - it has a whole load of protein inside so that adds neatly to my protein tally for the day (which I quite often find is lacking in my diet). RRP £3.99 for 350g. As a big kid at heart I would only be too happy tucking into a big bowl of some kind of sugar coated or chocolate cereal but hand on heart I am pleased to report t's been at least a couple of years since I buckled. The high protein mix has a fantastic crunch to it in a light way (your teeth are safe) so I decided to try it with yogurt - a greek style pot in the fridge was ideal. I have to say the mix was a taste sensation! One of the most enjoyable things I've discovered in years! 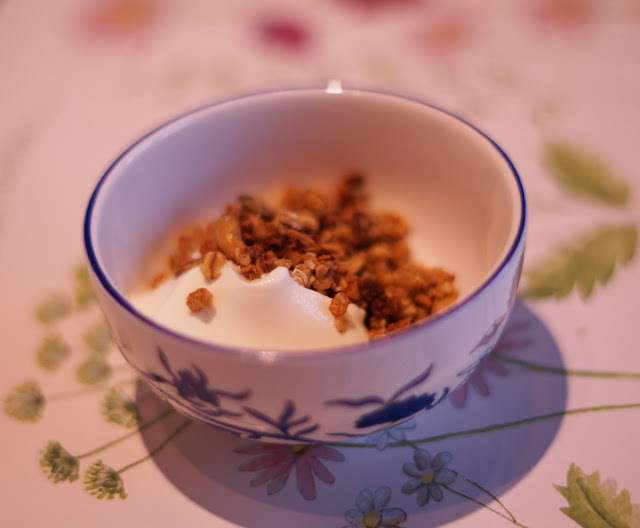 Rich, creamy yogurt and granola to start the day. I've eaten it twice again like this since and added another big pot to my shopping list. What I do really like about these granolas is that they are so versatile! 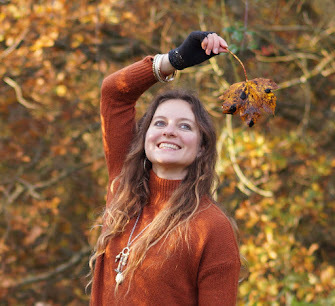 Eating just by the handful from the packet, with milk, with yogurt, with fruit, as a sprinkle on porridge, with hot milk in the winter for a real warmer, as part of baking for things like flapjacks and biscuits. The possibilities go on. You can buy online or in stores - I did spot a couple of packets in my local Tesco. I'm not really that big on granolas or crunchy cereals, I prefer mine soggy but they look nice!